These are the 31 challenges. I faced a few problems. I had neither orange nor yellow nail polish so you might get to see something else instead. And then there are some things that I really had to look up before hands. I wasn’t sure what a nail art inspired by the supernatural or galaxies would mean. And I went shopping. 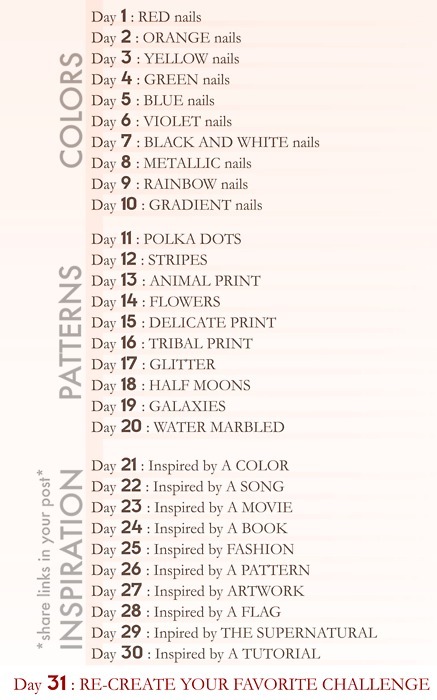 I bought some more nail polishes and am now very deeply immersed in the world of nail art so let the Challenge begin! If you want to know what might await you, check out my nailpolishes already. This entry was posted in Nail Art and tagged 31 day nail challenge by kathatravelling. Bookmark the permalink. Considering it takes me about an hour to put on just two coats of polish, I won’t be accepting this challenge, but I will be looking forward to your blog entries! I’ve been painting my nails ever since my mum allowed me to wear some so for maybe 16-18 years and I have some practice. It really depends on the polish how quick everything is finished.